Though legislation may not stop critics from shaming nursing mothers, women can finally legally breastfeed in public in all 50 states. For years, both Utah and Idaho did not have laws in place to protect breastfeeding mothers who needed to feed their babies in public spaces, but new legislation in the two states means that breastfeeding is now protected by law across the country. However, despite the promising new laws, many people have taken to social media to express their doubts and concerns. The bill passed in Utah first stating that “a woman may breastfeed in any place of public accommodation … irrespective of whether the woman’s breast is uncovered during or incidental to the breastfeeding,” which aligns with the rest of the country. But the legislation wasn’t exactly passed seamlessly. According to the Salt Lake Tribune, Republican representative Curt Webb wasn’t on board with the wording. The bill has since cut the latter portion but still reads that women can legally breastfeed in any place of public accommodation. It passed with a vote of 68-5. Idaho’s legislation ran a bit smoother, with a unanimous vote in favor of the bill protecting breastfeeding mothers from indecent exposure and obscenity laws, according to the Idaho Statesman. Though these two laws are steps in the right direction, many have voiced their doubts and concerns on social media. “Lobbyists from formula companies got the US to oppose a UN resolution voicing support for breastfeeding, so clearly there is vested financial/political interest to suppress it as much as possible,” one Reddit user wrote on a now-viral thread on the topic in the subReddit TwoXChromosomes. The Reddit user is referring to the United States’ recent opposition to a breastfeeding resolution that shocked world health officials in the spring. When hundreds of government delegates gathered in Geneva for the United Nations-affiliated World Healthy Assembly, they discussed a resolution intended to encourage breastfeeding. But the U.S. delegation upended deliberations, instead supporting infant formula manufacturers and arguing for the removal of language that calls on governments to “protect, promote and support breastfeeding.” The U.S. delegation also argued for the removal of another part of the resolution that calls on policymakers to restrict the promotion of food products that are often warned to have damaging effects on children. While breastfeeding in public space may be legal, then, some worry that nursing mothers will still be suppressed and discouraged. The World Health Organization reports that breastfeeding could prevent deaths — 823,000 infant deaths and 20,000 maternal deaths every year, worldwide. But a recent UNICEF report also found that, in high-income countries, more than one in five babies is never breastfed, as opposed to in low- and middle-income countries, where one in 25 babies is never breastfed. In fact, among high-income countries, Ireland, France and the United States have the three lowest breastfeeding rates. 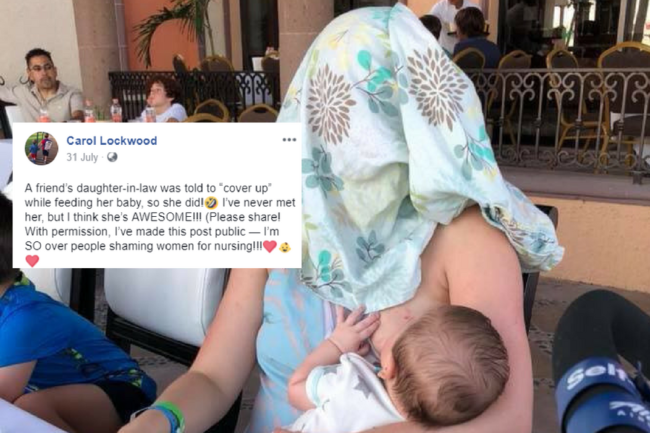 While the legislation means that numbers of breastfed babies may rise, women aren’t convinced that the shaming of women who breastfeed in public won’t stop. And, so long as society continues to shame women, some mothers will inevitably feel less inclined to breastfeed in public. “It’s still not gonna stop the millions of grown-up babies from whining about it whenever they see it, though,” another Reddit user added to the thread, reaffirming concerns over continued mom-shaming. 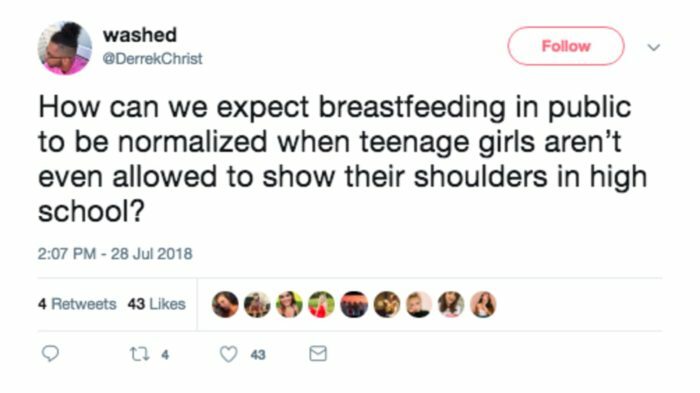 A Twitter user also brought up another point — women’s bodies are so hypersexualized that society may never be able to acknowledge the fact that breasts were biologically designed for breastfeeding. Even girls’ bodies are hypersexualized. The Twitter user points out that teenagers can’t even show their shoulders in high school. The new legislation is a step forward for nursing mothers who now have the law to protect them. But it will certainly still take time — and concerted efforts to unlearn much of what we’ve been told about women’s bodies — for the laws to be socialized.